It’s finally becoming a little cooler here in Texas, which means it’s the perfect time for sharpening my soup skills. The past few days have been rainy and chilly which left me craving something warm and comforting for dinner at night. Even better, something that is easy to make on a week night and will easily reheat. 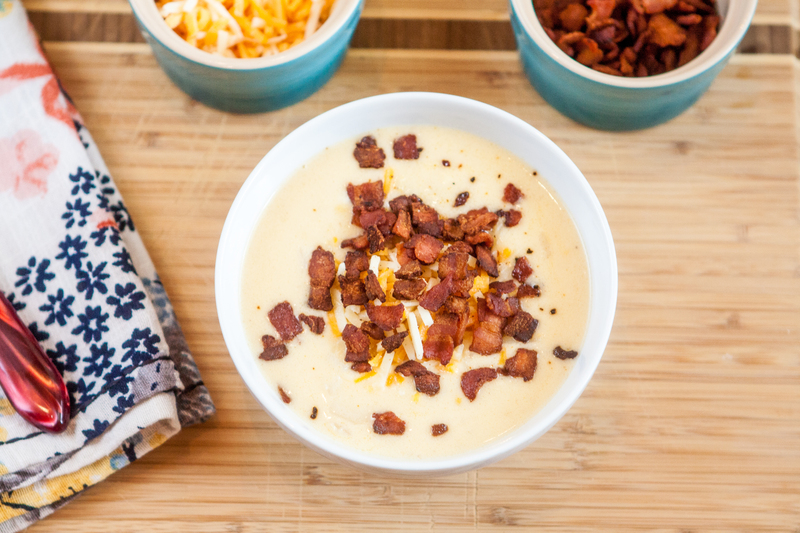 Nothing can beat a good Corn Chowder, especially when the key ingredients are cheddar cheese and bacon. Yes, please and thank you! 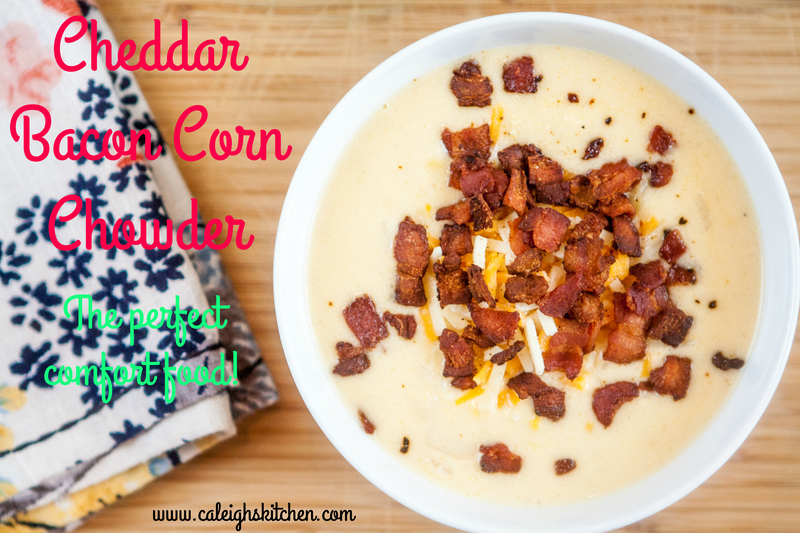 This Cheddar and Bacon Corn Chowder is so creamy and cheesy, ideal for those winter nights. One of the base ingredients for this Corn Chowder is a large sweet yellow onion, which is honestly my favorite base ingredient for most any dish lately. Can you believe I used to HATE onions? I can remember when I was little my parents made an onion casserole and tricked me into eating it by telling me it was potatoes. Somehow I was gullible enough to believe them and devoured it, but never quite trusted them about food again. (Of course they did something similar when they made me try a “Mountain Oyster”, bleh). I digress. I cut A LOT of onions now a days, thankfully Calphalon offers the fastest and easiest way to dice and slice them in this video. Make sure to check out other great tutorials on #KnifeSkills here! I am already a Calphalon fan, as I use their non-stick pots and pans daily. I absolutely love them! I was lucky enough to get a knife set to try out myself, and I absolutely love the self sharpening technology along with the website to help keep my skills just as sharp! 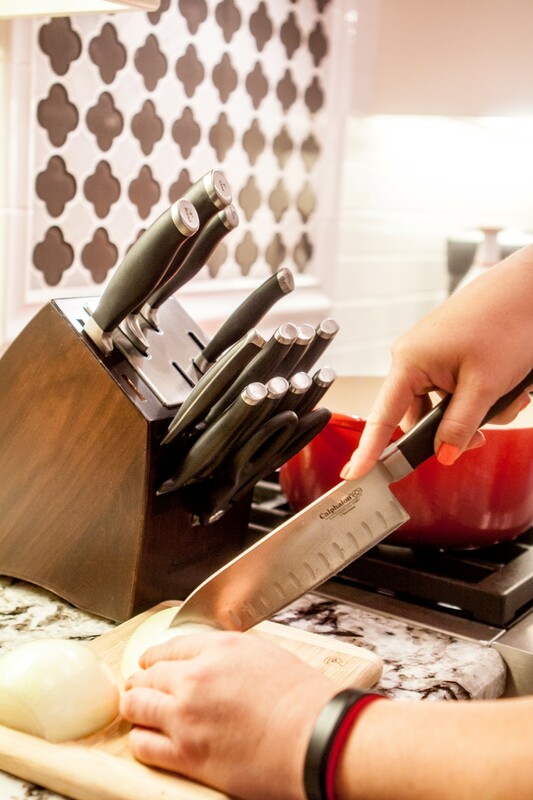 Now you have the chance to win a new 12 piece Calphalon Self-Sharpening Cutlery, as well! Contest entrants are only eligible to win once per sweepstake, per household as part of a campaign sponsored by Influence Central. Heat large dutch oven or pot over medium heat. Chop raw bacon into dices and cook in pot until crispy. Remove bacon and place on a plate lined with a paper towel, set aside. In the large pot, add Heat a large pot over medium-low heat and add the olive oil and butter to the remaining bacon grease. Once butter has melted, add onions, garlic, salt, pepper and garlic powder. Cook about 5 minutes, or until fragrant and onions are translucent. Add in the four and whisk constantly until onions are coated and roux starts to turn golden. Slowly whisk in the Chicken Broth until well combined. Add inn corn and increase the heat to medium high. Stir constantly until the broth begins to thicken. At this point, bring liquid to a boil and cover reducing to a simmer. Summer on low for 10 minutes. Remove cover and stir in half and half and cheese. Stir until the cheese melts completely. Stir in nutmeg and add additional salt and pepper if desired. Top with crumbled bacon and shredded cheddar. Serve immediately. Store left overs in an air tight container in refrigerator or freeze. Make sure to visit Calphalons websites and social media pages to learn more! Um, I just told the story about the onion casserole. Maybe why I’m still leery about onions! I’d have to try out this corn chowder! And probably some good ole potato soup too. Cheese is a hard thing to cut from a block, so I would use these to make some homemade baked nachos. I would make my son’s cheesy ranch potato casserole. I would make beef stew. Id make a veggie stir fry. The first thing I would make is fried potatoes with onions and green peppers. Our knives are ancient and dull. The weather is turning cool around me so I’d love to make a butternut squash and apple soup. I would make a nice roasted vegetable dish and some apple crisp. I would slice and dice chicken and potatoes for my “dump” slow cooker chicken dinner. I would make a pot roast with potatoes and carrots. I would make butternut squash. 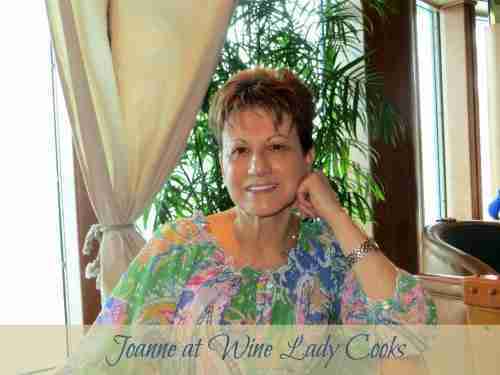 I would make a tasty Greek salad! I would ask my husband to make his homemade meatballs and spaghetti sauce! I would use it to cut vegetables. I would make stuffed peppers or fajitas. I love to cook! This looks like a great knife set. I love these knives and how wonderful that they have a built in sharpener. This chowder looks and sounds amazing, can’t wait to give it a try. With these new knives, I would make a butternut squash soup. I would make a stew. I would make a chicken and sausage gumbo! My husband loves corn chowder! Add the cheddar and bacon and he’ll go nuts for it! Thanks for the recipe! I would make salsa – a sharp knife is so important for this. I would make beef stew with all sorts of chopped veggies. I’d put these knives to work by making Vegetable Stir Fry. YUM! I’d love to make a salad platter along with fajitas. I have the best salsa recipe! Oh I would first love to use the set to make our Oven baked chicken fajitas! They are one of our families favorites…but so hard to cut it all up! These would make it a snap! This Corn Chowder is calling my name! And I am ready to start chopping!! YUM!!!! I would make chicken and dumplings! I would make my Hockey Soup recipe. I would make steamed carrots and onions. I would use this knife set on a daily basis for everything I make. I cook our diners at home almost every night. I’d make a cheesy squash casserole. Thanks for the giveaway! 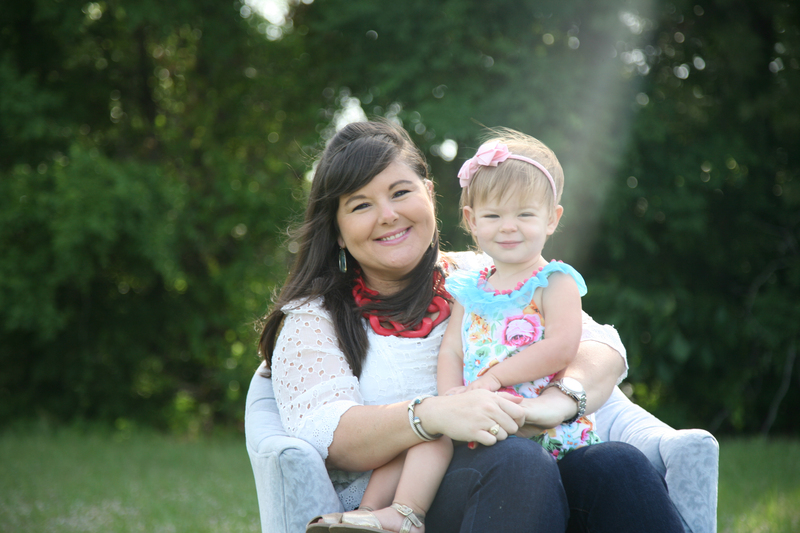 HilLesha recently posted…Gnoments: Making Every Moment Count! This seems like such an awesome knife set! Although, I would gift these to my Nana and would borrow them while at her house for the holidays! I would definitely make a fresh apple galette with cinnamon whipped cream. I would make green chili stew. I’d make my favorite — Fall Harvest Salad — roasted butternut squash, wild rice, pepitas, sweet apples, and hearty kale. Lots of chopping and dicing on this one! Your onion experience as a kid is my experience with eggplant … it was decades before I would even taste it again. This soup looks delightful — and those knives! So cool. I’d make beef fajitas. I need a good sharp knife to thinly slice the meat. I will be making eggplant parmesan! I would make baked ham and potatoes. Beef tips and egg noodles would be first, I haven’t had beef tips in a long time! Thanks for the chance! I would make some stuffed peppers! I would make beef stew! I would love to make beef vegetable soup! I’d start with a veggies stir fry! The first thing I would prepare with these knives is a salad. I would make my famous fajitas! I would make some kind of Asian dish, probably pad thai. What a gorgeous soup, I will definitely be making this. Thanks so much for linking up with us for Fabulous Foodie Fridays, have a great week!